A common problem in life science marketing is misalignment. Misalignment can severely impede your life science marketing efforts, resulting in a variety of symptoms. This issue examines this all too common problem. We begin with a simple assessment to help you determine if your marketing is correctly aligned. We’ll review the Marketing Mechanism of Action as a framework for understanding the four different types of misalignment. The alignment problem in life science marketing. This issue addresses a problem that is all too common in life science marketing – misalignment. Before I describe the problem in more detail, take this brief quiz: answer Yes or No to each of the following questions. (For brevity’s sake, when I refer to “your organization” I typically mean your organization, your products and/or your services.) I suggest you make note of your answers, as we’ll be referring to them later in this issue. Do you have a clear, written position statement that defines your organization’s unique competitive advantages and your target markets, used internally to guide the implementation of all your marketing efforts? Does your brand/story (for example, your messages, your “look and feel” and your content) clearly articulate your unique competitive position? Do all your touchpoints (e.g., your website, your trade show efforts, your whitepapers, your webinars, your email blasts) consistently express your brand/story? Do you have an integrated communications plan that addresses both internal and external audiences? Do your prospects see real differences between you and your competition? Have you tested your marketing communications to ensure that your audiences find them important, believable and compelling? Do you have a guiding document for your brand (or your messages or your corporate identity) and a person responsible for ensuring that these are coordinated at each customer touchpoint? Do your employees know who their top three competitors are, and how you are different/better than each? Are their answers consistent from employee to employee? Does your brand/story live everywhere, rather than just in the marketing department? If you answered “No” to any of these, your marketing efforts are not operating at full effectiveness, are they? You have one (or more) of four distinct, but related problems. We’ll refer to these related problems as an issue with your marketing “alignment.” Misalignment is a common problem in life science marketing. This could be one of four distinct, but related problems. The symptoms can be similar, which makes determining the exact cause difficult. When your marketing efforts are out of alignment, you have a mismatch somewhere along the Marketing Mechanism of Action. We’ll discuss how to score and interpret your answers to these questions in a minute, but first we’ll review the Marketing Mechanism of Action as a framework for understanding the four different kinds of misalignment. Your internal and external communications must be aligned in both strategy and tactics. That is, you must pay as much attention to your internal audiences as you do to your external ones. If you have misalignment in your marketing, your audiences may still have an impression of your organization, your products or your services, but you role in shaping or influencing this image will have been very, very small. If all of these steps are working as planned, your audiences (both internal and external) will have a clear impression of your organization, an impression that you will have shaped. And of course this impression will feature your organization, your products and our services in the best possible light and be the most important, believable and motivating (compelling) to your audiences. Figure 1: The Marketing Mechanism of Action describes how your marketing strategies and tactics help your audiences shape their impression of your organization, products and services, leading to changes in their attitudes, beliefs and behaviors. On the other hand, if you have misalignment at one or more of these steps, your audiences (again, both internal and external) will still have an impression of your organization, but your role in shaping or influencing this image will have been very small, so your audience will think whatever they want about your organization. Your audiences will still be basing their impressions of your organization, your products and your services on information and impressions, but these will be largely outside of your control. When this happens, your marketing is ineffective. Because your audiences have decided (without significant input from you) what attributes they will ascribe to your organization, your products or your services, you’ll have to spend a lot of money trying to correct their misinterpretations. There are four key steps in the Marketing Mechanism of Action. Since there can be misalignment associated with each step, there are four types of alignment challenges. There are four basic types of misalignment, related to the four key steps in the Marketing Mechanism of Action. First, the misalignment could be between your position and your audiences’ needs. This is an issue with your position and whether it meets the key criteria for an effective position: clear, unique, authentic, sustainable, important, believable and compelling. This is a strategic alignment issue. If you answered “No” to questions 1 or 5, you could be suffering from this type of misalignment. 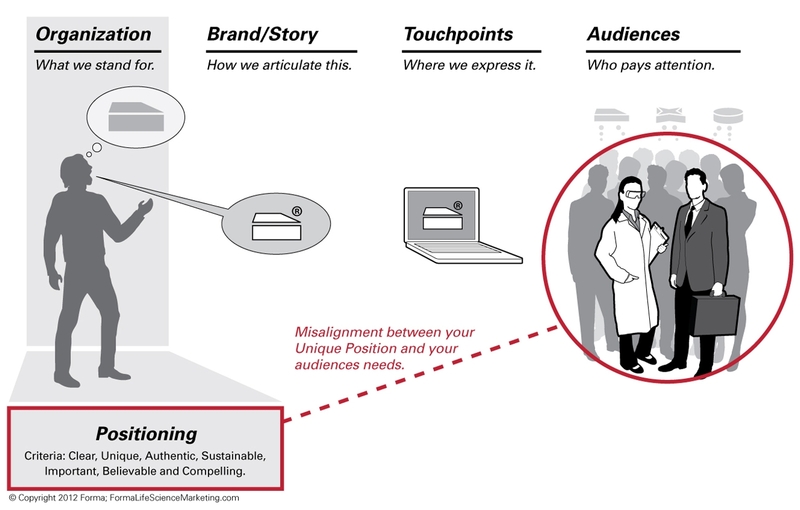 Figure 2: Misalignment between your position and your audiences’ needs. Second, the misalignment could be between your position and your brand/story. This is an issue with how your position is articulated, and so is an issue with the way you bridge the gap between your marketing strategy and your marketing tactics. If you answered “No” to questions 2 or 6, you could be suffering from this type of misalignment. Figure 3: Misalignment between your position and your brand/story. 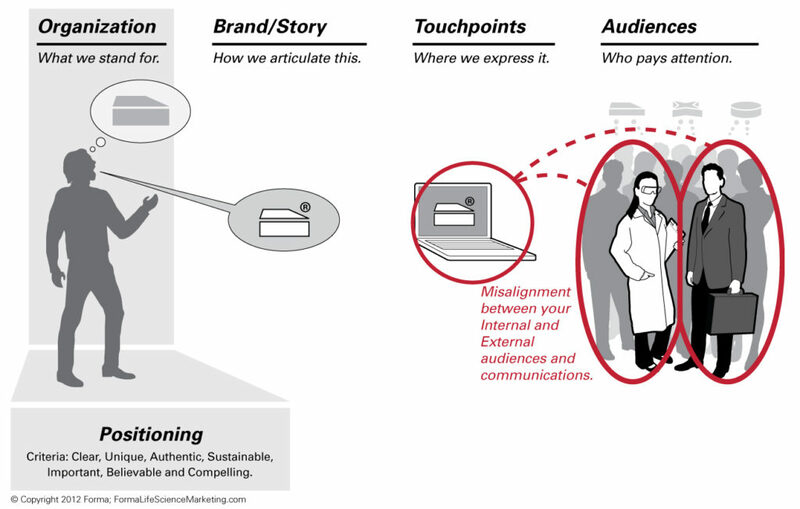 Third, the misalignment could be between your brand/story and your touchpoints. This is a tactical alignment issue, that is: your touchpoints are not aligned with your core verbal and visual messages. If you answered “No” to questions 3 or 7, you could be suffering from this type of misalignment. 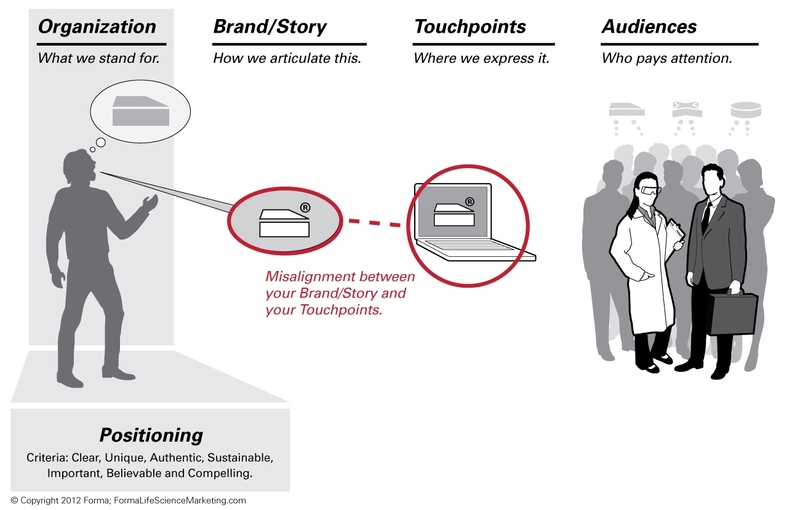 Figure 4: Misalignment between your brand/story and your touchpoints. Last, the misalignment could be between your internal and your external audiences and communications. This is a tactical alignment issue, but is more focused on execution than the previous one. If you answered “No” to questions 4, 8 or 9, you could be suffering from this type of misalignment. Figure 5: Misalignment between your internal and external audiences and communications. Symptoms of misalignment in life science marketing. poor employee engagement (including, perhaps, high turnover). Not all of these symptoms are caused solely by marketing misalignment – for example, there can be many additional reasons for poor employee engagement. But marketing misalignment can be a strong contributing factor to many of these. Do you recognize these symptoms as your own? Treating misalignment depends upon what is causing your symptoms. It is important to diagnose your specific condition clearly, lest you end up with the wrong treatment. Alignment issues present a large challenge, and many of the symptoms can be similar, even though the causes can be distinct. For example, pick one of the symptoms mentioned above: a confused marketplace (“What exactly do they stand for?). 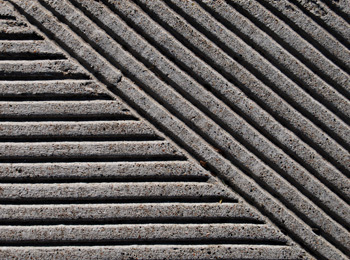 Any of the four different types of misalignment can result in this particular symptom. This is also true of other symptoms and because similar symptoms can result from different causes, diagnosing the true cause(s) can be difficult. But diagnosis is the important first step in addressing this issue and getting your marketing efforts back on track. There are many challenges in fixing misalignment issues, and the treatment depends on which symptoms your organization exhibits and the severity of your specific challenges. Before you begin treating these issues, understanding and diagnosing the different types of misalignment will enable you to address your individual challenges. We’ll discuss specific diagnostic tools you can use to sort out one type of misalignment from another in a future issue. Misalignment in life science marketing is an all-too-common problem. 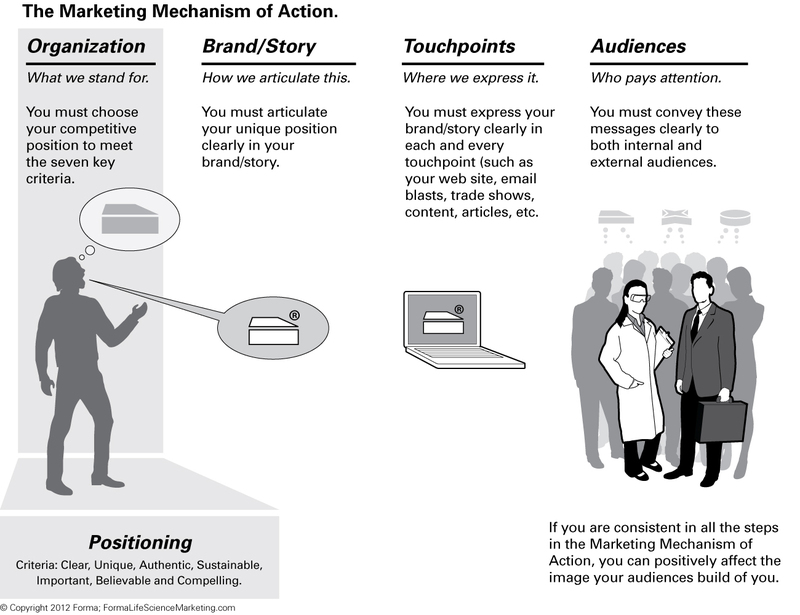 There are four key steps in the Marketing Mechanism of Action. Consequently, there are four major types of misalignment. Misalignment 1: Your position is not aligned with your audiences’ needs. Misalignment 2: Your brand/story is not aligned with your position. 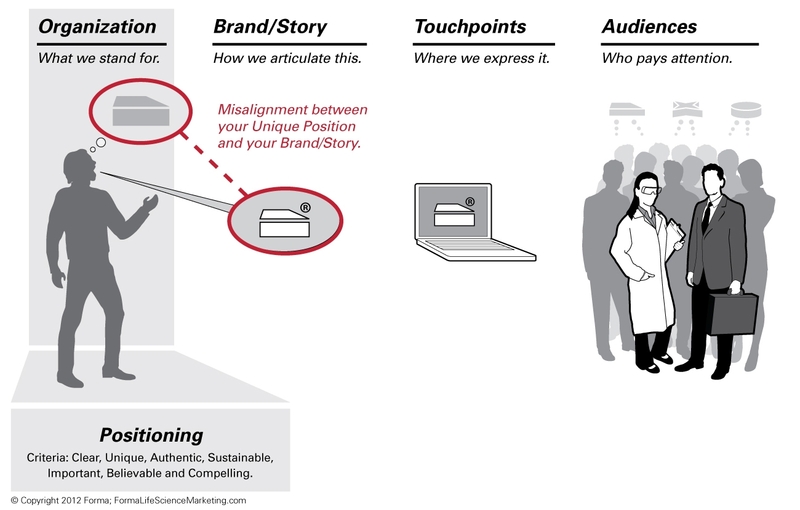 Misalignment 3: Your touchpoints are not aligned with your brand story. Misalignment 4: Your internal and external communications are not aligned. A clear diagnosis is crucial in identifying which type of misalignment is present. © 2012 Forma Life Science Marketing, Inc. All rights reserved. No part of this document may be reproduced or transmitted without obtaining written permission from Forma Life Science Marketing.